ChemChamp is the recognized leader in delivering innovative & cost effective solutions for on-site chemical recycling, paint-gun cleaning & related technologies. ChemChamp - Delivering award-winning, earth-friendly technologies that improve performance and reduce operating cost. CHEMCHAMP solvent recyclers and distillation equipment bring unprecedented performance and cost reductions to your operations by providing clean solvent 24/7. 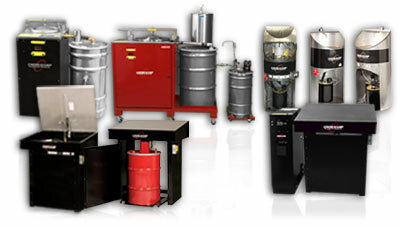 ChemChamp’s easy-to-use equipment maximizes performance by reducing waste, disposal costs and downtime. ChemChamp solvent recyclers are automatic. No more setting timers or adjusting temperature controls. ChemChamp customers also benefit from the added performance and safety provided by ChemChamp’s patented systems, including: Vapor Management Systems, Anti-Pressure Systems, and Direct Condensation Systems. Whether it’s paint-gun cleaning, chemical recycling, or ChemChamp’s latest innovation – the C Pump, our customers can rest assured that they are getting high quality products that make sense – economically and environmentally. ChemChamp - Recycling our resources.